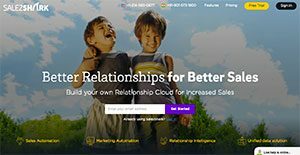 SalezShark is an innovative relationship cloud platform that leverages CRM tools and techniques to help you establish enduring engagements with your prospects and customers. With its very unique relationship management architecture, SalezShark facilitates converting leads into paying customers in no time by identifying ways on how to nurture each relationships and, in turn, improve your company’s bottom line. With SalezShark, you and your sales team are provided with smart features to save time and boost productivity. The system is built on a very intuitive technology meant to effectively manage data derived from your sales professionals. This becomes basis for generating accurate and actionable performance reports and project analysis to help you in your sales and operational decisions. With SalezShark, businesses have access to tools and technologies that are created to forge better, stronger customer relationships. You can easily determine customer patterns, personal characteristics, and more. The better you know them makes it easier to devise and implement sales strategies that work. SalezShark delivers a single, comprehensive solution that helps you nurture your prospect base and widen your reach. This enables you to access millions of records and data intelligence, arming you with the information you need to filter, identify, and work on business opportunities. The system also lets you boost your productivity with its mobile web app. Even on the go, you’ll find it easy to manage your leads and activities and you can close more sales. Each company has different wants and needs an application that can be personalized for their size, type of staff members and customers, and the specific industry they are in. For these reasons, no platform can provide perfect tools out-of-the-box. When you look for a software system, first be sure what you need it for. Read some SalezShark reviews and ask yourself do you desire basic features or do you require complex tools? Are there any industry-specific features that you are looking for? Obtain the answers to these queries to aid your search. There are plenty of factors that you need to consider and these include your budget, specific business wants, your company size, integration requirements etc. Take your time, check out a few free trials, and finally choose the system that offers all that you need to enhance your firm competence and productivity. How Much Does SalezShark Cost? We realize that when you make a decision to buy CRM Software it’s important not only to see how experts evaluate it in their reviews, but also to find out if the real people and companies that buy it are actually satisfied with the product. That’s why we’ve created our behavior-based Customer Satisfaction Algorithm™ that gathers customer reviews, comments and SalezShark reviews across a wide range of social media sites. The data is then presented in an easy to digest form showing how many people had positive and negative experience with SalezShark. With that information at hand you should be equipped to make an informed buying decision that you won’t regret. What are SalezShark pricing details? What integrations are available for SalezShark? This solution has helped me to drive my team performance to a whole new level. Metrics-based goals, notifications, reminders and work progress are all I can do whenever wherever with all ease. And it’s going to be easier as the mobile app 2.0 is launching soon. I am hence a happy and content customer of SalezShark. Pros: User friendly interface, Real time data access on mobile devices, quality global business data offered through dataguru(only B2B) , dedicated support manager for all your technical and other related issues. Cons: Inability to generate the invoice. If you need more information about SalezShark or you simply have a question let us know what you need and we’ll forward your request directly to the vendor.